I must admit, I did not embrace the BB cream craze with reckless abandon. Years ago, I ordered some Japanese and Korean versions; I was intrigued with the novelty but not entirely charmed by the effect. I am a traditional foundation girl...if I am going to take the time to adeptly apply base to my face, then I prefer seamless and satin medium to full coverage rather than a tinted moisturizer with a trendy name. In turn, when CC creams hit the scene, I was ambivalent. 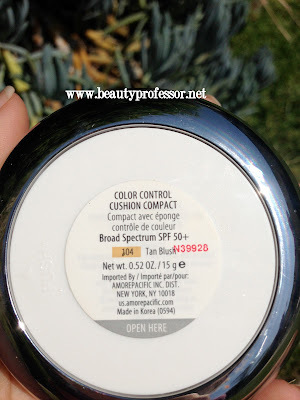 While I am always on the hunt for the latest innovation in foundation, I was skeptical that the arrival of the CC cream (which stands for "color control" and aims to meld advanced skincare with the color correcting properties of foundation) was merely an attempt to capitalize on the mass impact of BB cream. 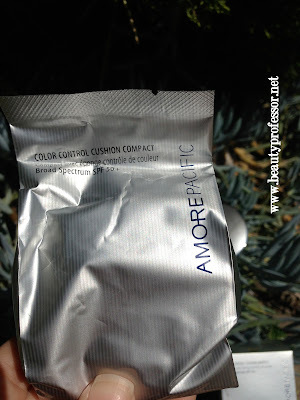 Although I cannot speak with authority on every CC cream on the market, I can confirm that there is one that has significantly exceeded my expectations...the Amore Pacific Color Control Cushion Compact. Available at Nordstrom, Neiman Marcus, Sephora and Net-a-Porter and retailing for a very reasonable $60 (especially because it comes with a refill! ), this alliterative base is designed to refine the skin, provide immense SPF protection (SPF 50! ), encourage balanced hydration, and give buildable coverage that reduces the look of pores, hyper pigmentation and unevenness. Broad Spectrum SPF 50+ protects against both harmful UVA and UVB rays. Dynamic Fluid Capture System Technology transforms liquid into a refined emulsion. Non-absorbing ruby-cell puff applicator cools and soothes the skin. The Exclusive Long-Lasting Complex™ proprietary skin technology fills micro lines and ensures color builds into fine even layers. Green Tea Treatment Complex™ brightens and prevents skin irritation while providing superior antioxidant protection. Hydrating Bamboo Sap Formula replaces traditional water in oil base for deep moisturization. 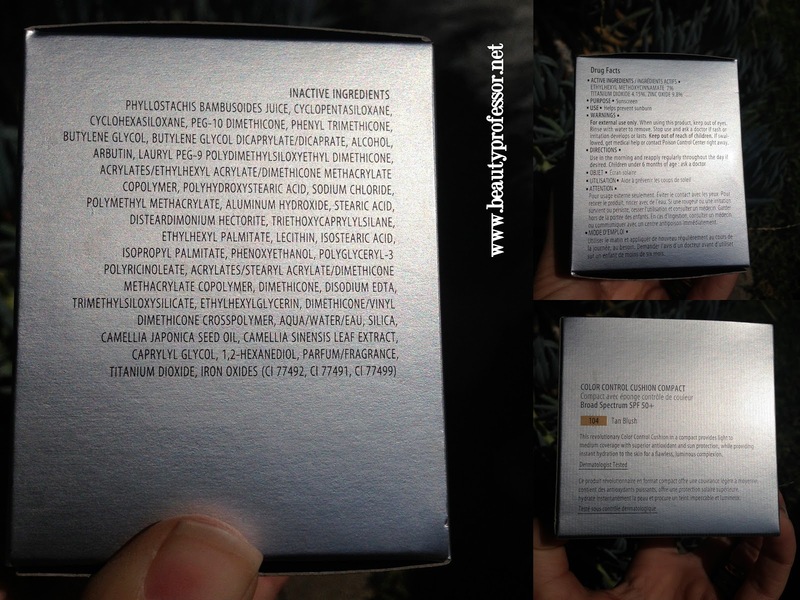 Above: The packaging details and, most importantly, the ingredients (also listed below). Above: The generous refill package...I cannot ever remember a time when a foundation I've bought comes with a refill (except the extremely diminutive vials of Ellis Faas Skin Veil that come with the bullet pen). Above: I selected #104 Tan Blush as my winter shade...this color seems to be an excellent match for NC 20-25 skin. I have been very impressed with this foundation so far...after applying my Peau Vierge #2 as a base, I use the puff to soak up the product and gently press it into my skin. It takes me about 60 seconds to fully apply this to my entire face using this process. I don't recommend using a brush or your fingers...the puff is specially-designed to work best with the CC cream-drenched sponge and I have found my best results come from honoring this intended pairing. The CC cream feels cool to the touch and instantly becomes one with my face, literally rendering itself undetectable upon application. The formula is very thin, but somehow miraculously covers hyperpigmentation with a few effortless pats of the puff. I would deem this a medium (and perhaps buildable just to the cusp of "full") coverage foundation. The finish is slightly dewy and very skin like (on a day when your skin is on its best behavior! ), but it doesn't degrade to an unpleasantly oily situation, even after hours of wear. It is important to note that this does contain a rather strong fragrance..."perfumy" is the best way I can describe it...but my nose is not offended nor is my sensitive skin irritated by this addition (I've tried this for nearly a week without incident, but will definitely amend this post should I notice an adverse reaction). With a light dusting of powder (in my case Serge Lutens Teint Si Fin in O40...review soon! ), this lasts the entire day without shifting or pooling...I believe that it might even be waterproof, because it does not come off in the shower (in fact, it remains perfectly in place...I've checked in the mirror!) until I use soap and my wash cloth or exfoliating gloves to cleanse. This indomitable spirit is sure to be an asset in the summertime heat that this just around the corner! Above: No, you are not seeing things...when pressed with the applicator, this spongey material releases the "CC cream" housed within the porous crevices of the sponge. Above: I appreciate the space age presentation of the compact...very sleek and modern with a generous mirror and separate compartment on which the antimicrobial puff applicator rests. Above: The specially-designed sponge puff applicator works harmoniously with the foundation-soaked sponge to absorb just the right amount of product with each dab. Somehow, this extremely thin concoction manages to cover a multitude of sins! 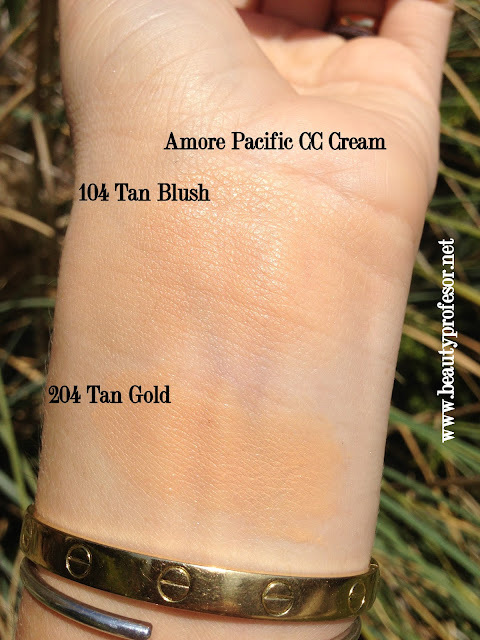 104 Tan Blush...light neutral to yellow beige closest to NC 20 (what I am wearing now in the dead of winter) but those a bit lighter could also likely get away with this shade. 106 Almond Blush...light neutral to rosy beige for skin in the NW 20-25 range. More of a "true beige"
204 Tan Gold...neutral to yellow beige in the NC 25-30 range. I will likely wear this shade once summer arrives. 208 Amber Gold...warm medium to dark beige in the NC 35 plus range. I have heard that they will be releasing darker shades in the American market in the coming months...this intent to account for skin tones of every shade on the spectrum is promising and necessary! **UPDATE 7/2/14: Recent articles on this formula in Seventeen, Elle and Harper's Bazaar have prompted many inquiries regarding swatches of all four shades, which I was able to procure last month...enjoy! Above: Swatches of all four shades in natural light. Above: Swatches of 104 and 204 in direct sunlight. Above: Swatches of 104 and 204 in the shade. Above: Even after vigorously rubbing my wrist, the color and slight sheen remains! Above: All I am wearing here is a bit of LMdB Peau Vierge #2, Amore Pacific Color Control Cushion Compact in #104 and a touch of Rouge Bunny Rouge Bronzing Powder in At Goldcombe Bay. Sorry for the morose expression...I was just getting over the 24 hour flu, but really wanted to give this a try, even without a fully done face. Above: This was taken in my car away from direct light. Above: This was taken first thing in the morning, facing the sunlight through a tinted car window. Above: This picture was taken outdoors in natural sunlight and best reflects what this product looks like (in terms of texture, glow and color) on my skin. 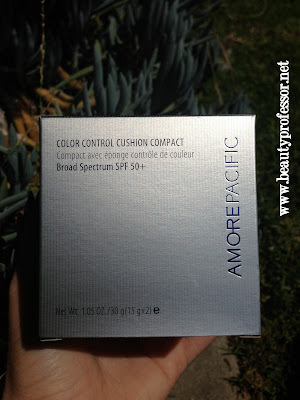 Bottom Line: The Amore Pacific Color Control Cushion Compact, available at Nordstrom, Neiman Marcus, Sephora and Net-a-Porter is truly in a class by itself. Its extreme SPF protection, whisper light texture, an undetectable and lasting finish and the ability to thoroughly refine and perfect the skin while looking incredibly natural make it a remarkable find...the fact that it contains skincare benefits further enhances its worth. I have only used this for a week thus far, and am excited to see how it performs over time (especially as the weather gets warmer); I'll make sure to update this post with any changes or news. 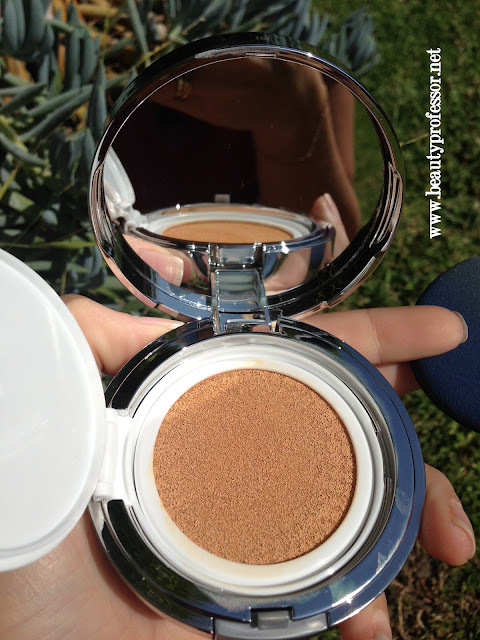 In this meanwhile, this compact has found a new home, comfortably nestled in the inner pocket of my purse! What is your experience with CC creams? Will you be giving the Amore Pacific Color Control Cushion Compact a spin? Thoughts? My video on application can be found HERE! Thank you for such a comprehensive review. I'm definitely intrigued. My pleasure...it is a fascinating product on all accounts! Hope your week is going well! Thanks for another super review. I fear reading your wonderful blog is getting to be quite an expensive habit since I want to purchase everything you review favorably. A cursory accounting of my recent beauty-related purchases are all Beauty Professor endorsed, and I have enjoyed each and every item so far. 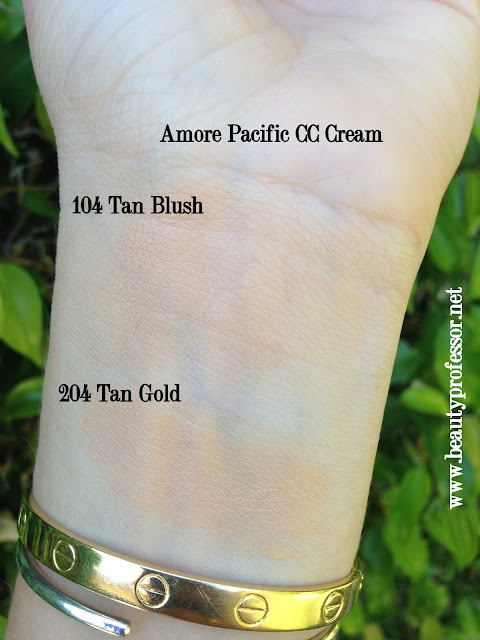 Incidentally, I have just ordered this CC cream and can't wait till its arrival at my door. You know how I just can't resist a foundation/base product in my quest for that ultimate Holy Grail. So happy you enjoyed the review...there seems to be very little about this product in terms of swatches and details so I was eager to post this quickly! I am honored that you take my reviews to heart and am thrilled that you are happy with your purchase...it brings a smile to my face, indeed ; ) You must tell me what you think of this wild product...I've used it every day since getting it and marvel at the coverage it gives...it just doesn't seem that opaque but somehow it covers like a dream! Take care, have a lovely weekend and do keep me posted! Looks lovely on you! Thanks for the great review and swatches, BP. Onward to the next release! It looks amazing. I haven't jumped on the c.c bandwagon yet either but with your endorsment, I may take the plunge. Not sure what color to order as I am nc25 but will selftan soon. Thanku again. I love your blog so much. Congrats on the Beauty blogger to know but we already knew how valuable you are! 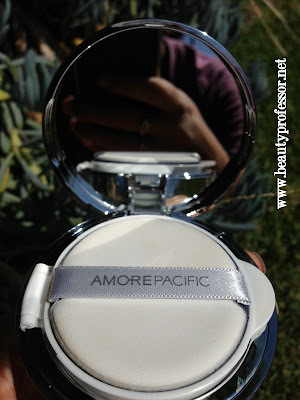 Thanks for your sweet words...I love writing about makeup I adore and my readers (like YOU!) make it such a blessing for me! This looks fantastic on you BP! I too, like the space-age appearance of the compact. And gasp, a refill?!?!?! I think this is the only face product I've ever heard of that comes with a refill. Some face products don't even come with a pump *cough*NARS*cough* For a foundation that is medium coverage that sidles up next to full coverage, this does not look heavy or cakey on your face at all. I appreciate that you include pictures in a variety of light settings! Doing so gives me a better idea of how a product will look IRL. I also appreciate knowing how it holds up on you throughout the course of the day & that it requires cleanser & a face cloth to remove. This definitely would make it one to consider once the weather warms up if there was a suitable color match. I would love to see a shade lighter than 104. Perhaps a lighter sister to 106 that leans rosy for those of us that are cool. I've tried some BB creams, both US formulations & Asian ones. I have found a Missha one that I like & that the color works on my cool toned skin. However, I don't find them to be the end all of face products. IMO, BB creams are just another option for foundation. I still do all of my regular skin care underneath before applying. But that's just me. And I haven't tried any of the CC creams. Thank you, Love2Read68!! I know...I was utterly floored at the notion of a product containing a refill...it is such a generous gesture and oh, so rare in this mass consumption society in which we live! Thanks for noticing my attempt to show how it looks in different lighting...sometimes it's hard to pull that off, but I know that is what I like to see when deciding on a product, especially foundation! Your thoughts about BB creams resonate with my thinking as well...I don't think I would ever let a foundation formula (no matter how advanced) super cede my need for a layer of basic skincare (e.g., moisturizer, primer and SPF). great review thank you! just bought this and i'm wondering, do you press this on to your skin or swipe/blend..?? Thank you! I press this onto my skin with a light patting motion (rather than swipe or blend)...this seems to provide the best coverage and lasting power! Thanks for your sweet words and have a wonderful weekend! This looks intriguing. Where can I purchase it? I'd love to try it on first. I like the idea that it comes in acompact and I can appy it later in the day if need be. This can be purchased at Sephora, Nordstrom (online) and Neiman Marcus (to name a few retailers! 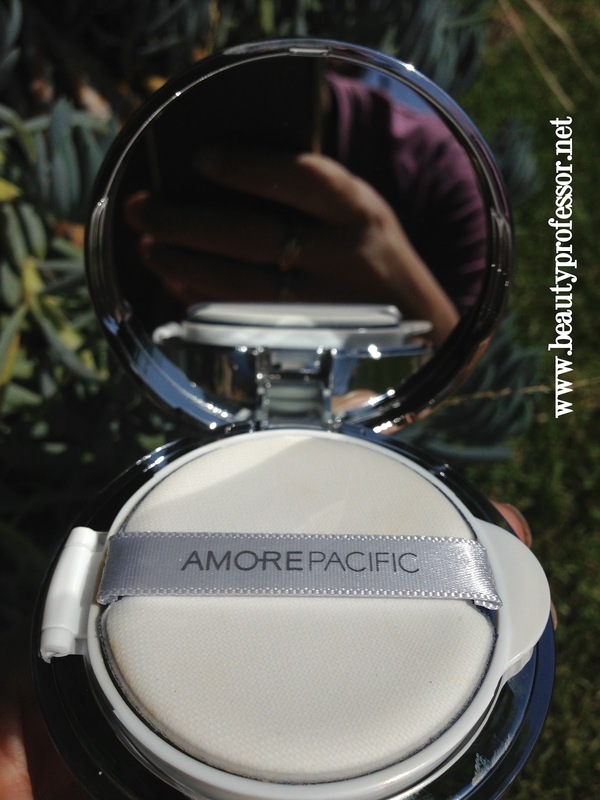 )...the compact packaging does indeed make it really handy for touchups throughout the day! I am going to take advantage of the Sephora discount and pick this up. I am excited to try it. 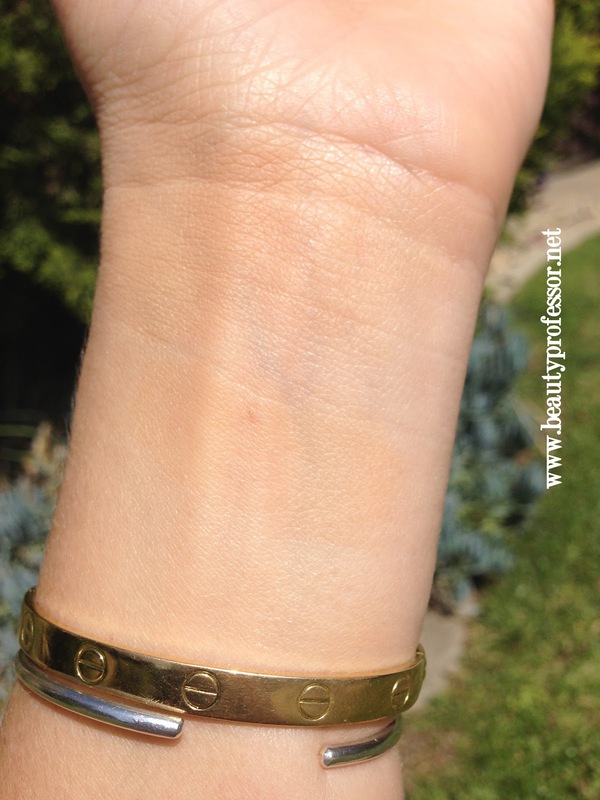 I tried a drugstore version of CC cream and I am not too impressed. Wonderful review! So glad you liked my review! Great review again...very intrigued by this product and love their skincare line. How does it compare finish and coverage-wise to By Terry Cover and/or Sheer Expert (which I love; thank you for the rec!)? Thanks, Melinda! So glad you enjoyed ; ) I would say that it is medium coverage (less than By Terry Cover Expert and more than By Terry Sheer Expert) and is more on the glowing side, like the finish of the Sheer Expert. Thanks for your question...I wish I could help you with complete certainty but didn't get a great swatch of 106 (but I can confirm that #106 is a bit darker than #104)! #204 definitely has yellow tones so I don't think it will be the best match for you. Have you looked into ordering #104 online at Nordstrom instead of Sephora...I just checked and #104 is still in stock! Hi again, thanks so much for your timely response. Thankyou for the update, I went on to Nordstrom and the advisor said to try 106 so I ordered it. Can't wait for it to arrive and I will let u know how ot works. I do have a nordsrom close by so if it doesnt work out I can easily bring it back. THANKS AGAIN! Hello Lynn...good to hear from you! Thanks for the update...I am bummed that #106 is a bit dark for you (I have a hunch that #104 quite possibly could be perfect) but am glad you are pleased with the overall texture and glow. It is so very light yet the coverage is significant! You are a true joy to communicate with...take are and have a lovely weekend! Hi Lynn...good to hear from you! Yes, if you are getting to exchange, #104 might be worth a try! Can't wait to hear your thoughts. I have seen the Jouer line and it is beautiful...I've read a plethora of positive reviews on the luminizing tint but haven't yet had a chance to try it. I will forever be on the quest for the perfect foundation and love the journey...too much fun ; ) I am currently trying the Kanebo Sensai Cream Foundation and am really impressed thus far...great staying power for a cream! The LMdB counter this weekend was a lot of fun...thank you! I hope your weekend was restful and enjoyable as well. Nice review. It looks really great on you! I really like this product myself. I love how this evens out my face...almost magically. When I put it on, I think it's not doing anything and then when I'm done...my face is subtly transformed. It's a light coverage but corrects very well. I think it's great for everyday. 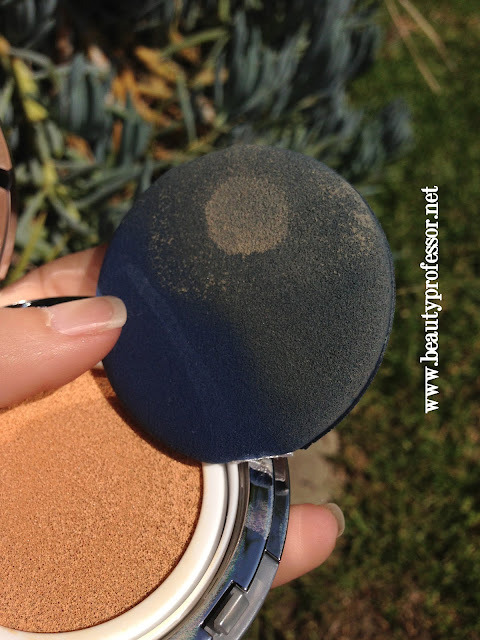 I do set it a bit of powder-either Prescriptives Mineral Powder or MAC Mineralize. I'm planning on getting the Tom Ford Transluscent Finishing powder so I'll see how it works with this. For special events, I do use Hourglass primer and a different foundation. But, it's so worth it for daily use when you're on the go. My only issue is the color selection. I originally got the 204 and it was waaay too light. I then got the 208. It was a bit dark at first but then I went to Hawaii and now it's a little too light and even though it's supposed to be more yellow, it's still a bit pink on me. But, that's OK with me since my neck is lighter than my face and I set with powder with a bit more yellow. Overall, not a HG but a very close 2nd. I'm oily but dry. And this stays dewy all day. I don't look "made-up" I just look like me...but better. Thank you for your comment! You explain the effects of this foundation so well...it truly doesn't feel like it is providing coverage when I am applying it because it is so thin. However, by the time I am finished, my skin is perfected...excellent! Thanks also for sharing the products that you like to use with this...I have experimented with both the NARS Light Reflecting Powder and my beloved Serge Lutens Teint Si Fin and both add a lovely layer of setting power. The color selection definitely has room for improvement...specifically more options with yellow (rather than neutral to rosy) undertones! I hope that the success of the release of this product prompts the company to create more shades soon! You are never too late to ask a question here ; ) I love that they made sample sizes of this...I bet it is adorable. If you are looking for a perfect finishing powder that adds no color but refines the skin and removes excess shine, then I suggest the NARS Light Reflecting Pressed Powder (review soon!). I featured it in a recent video and absolutely love the fact that it makes your skin look better without disrupting the texture or color of foundation. I think you'll love it!! This was a fantastic review! Tell me, would 208 work for an NC42? Thank you! I do think it would likely work! So I'm just discovering this product and mulling over whether or not to purchase sight unseen. I'm curious, how long has each cushion lasted for you? Coming with a replacement is great since it's just a bit pricey, unless combined both cushions end up lasting as long as typical foundation. And how did it do in the summer? Thanks! Thanks for the question. 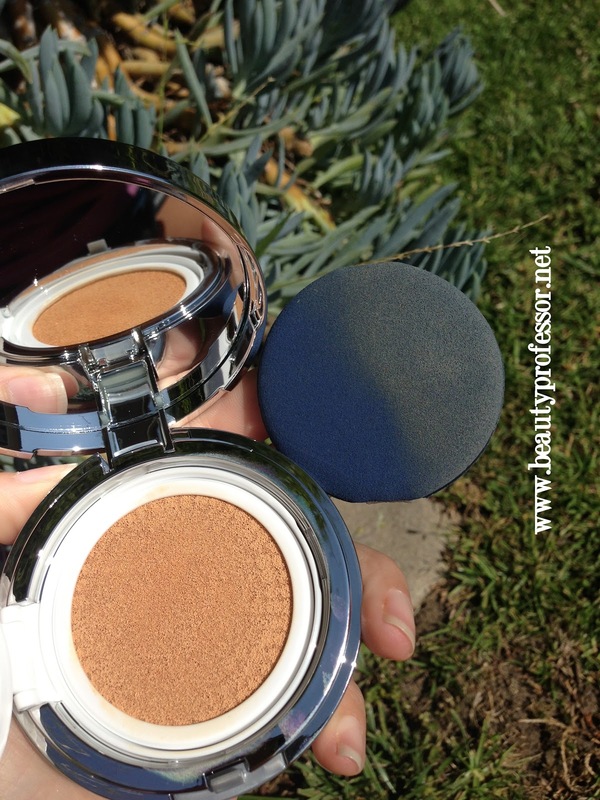 Each cushion lasted me 2-3 months of daily use and, while it holds up in the summer, the formula can look quite glowy without some powder on top. I really want to order this cushion but am unsure what my color would be. I guess I could always order 2 from Nordstrom and keep whichever seems to match more. I use Giorgio Armani Luminous Silk in 5.75/Laura Mercier Tinted Moisturizer in Fawn (I guess I'm somewhere in b/w NC25-30) and think I have yellow-tone skin (I'm Indian) - do you think I should try 204? Is 208 much darker? I would suggest #204 as #208 is much darker and beyond NC 30.